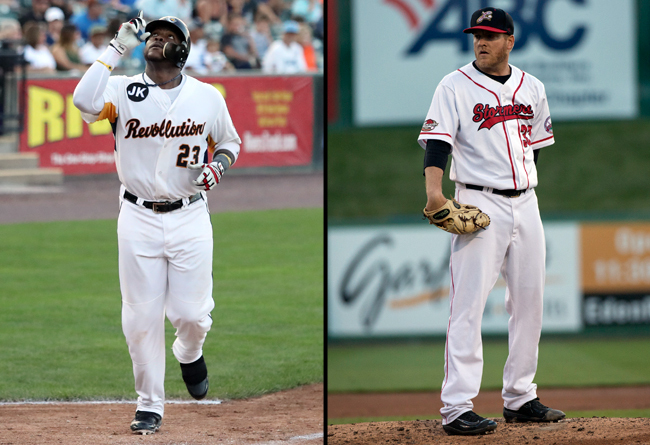 (Lancaster, Pa., Sept. 6, 2018) – The Atlantic League of Professional Baseball Clubs (ALPB) today named the recipients of the league’s August Player and Pitcher of the Month awards. York Revolution infielder Telvin Nash has been named the Atlantic League’s Player of the Month. The slugger returned to the club after starting the season in the Mexican League with Los Bravos de Leon. In 25 games with York in August, he compiled team-leading totals in batting average (.375), on-base percentage (472) and slugging percentage (.761). He also led the Revolution with nine home runs and 17 walks while ranking second in RBIs (26), runs (23) and hits (33). The 27-year-old launched two home runs in his first game back with York on August 3rd against Southern Maryland and hit safely in 19 games during the month, registering multiple hits in 10 of those games. He also drove in at least one run in 15 of his 25 games played. Lancaster Barnstormers left-hander Nate Reed has been chosen as the Atlantic League’s Pitcher of the Month. Reed earns the distinction for the second time this season after previously being named the Pitcher of the Month for April/May. The 30-year-old made four starts during the month and posted a 3-0 record with a team-best 1.96 ERA. In 23 innings of work, he struck out 24 batters while walking just five and held opponents to a miniscule .205 batting average against. The southpaw’s performance helped him lower his season ERA by nearly half a run. His month was capped off by tossing six innings of two-hit, shutout baseball while striking out nine batters in a 6-3 win over the Somerset Patriots on August 26th.